Emily Dickinson was one of the most mysterious American writers of the XIX century. And this mystery lies in the fact that her contemporaries did not consider her an author worthy of attention. Emily lived more than secludedly – this was the principle of her family’s life. However, posthumous publications have made her name known. Emily wrote the poem “There is another sky” specially for her brother, sent to the big city to study. Thanks to these letters, Emily Dickinson’s poetic works went beyond her home, and were subsequently published. 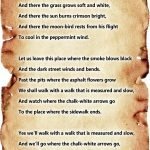 The poem “There is another sky” can be considered a message intended to support a person who was far from home, and a philosophical sonnet filled with images that are far from the gray routine. What did Emily use to support a loved one? It is difficult to understand the depth of images that the author offers us. “There is another sky” – we can only guess what this image resembles. Maybe it is about the world of dreams, or maybe paradise. However, Emily is convinced that “There is another sky, Ever serene and fair“. The most obvious reading of these words is in a religious context. The sky above each person can be a blue and deep, or covered with storm clouds. However, whatever the sky, we always know about the existence of paradise, where the weather is always beautiful. This image, filled with hope, is the central metaphor for the entire poem, its central symbol. The call to keep in my soul faith and hope for the best – for a better world, for brighter colors, for joy, embodied in all nature – is literally spilled throughout the poem. 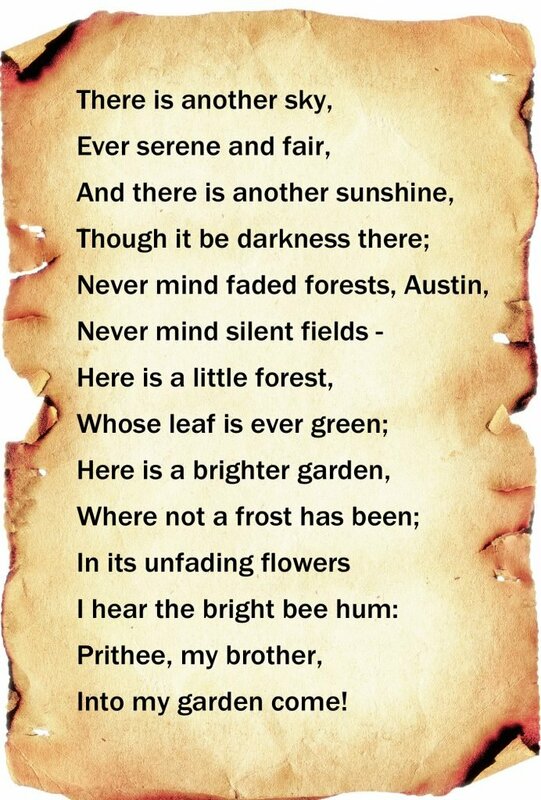 Most likely, the poem was a response to some letter from the poet’s brother, Austin, in which he complained of confusion or sadness. Emily offers in response a figurative reminder of the world, which, most obviously, was familiar to both interlocutors from childhood. Perhaps, these are some stories of parents, or their own childhood dreams. And this world, dreams or stories, according to the author, can become that compass, with which even in the most difficult situation a person can find a way out and overcome confusion. “Here is a brighter garden, Where not a frost has been” – the image of an ideal eternity, paradise of serenity, apparently, really became for Austin a serious support in his adult life. “Unfading flowers, … bright bee hum” – these images really strongly resemble a picture of paradise. There is an interpretation of this poem by Emily Dickinson, in which the invitation “Into my garden come” refers not so much to the dream garden described, as to the poetry of Emily. Perhaps, it was this trip that helped Austin later realize his sister’s dream and print her poetic collection. He does point out in his memoirs that he found his sister’s verses were very supportive. However, there is another interpretation, according to which the image drawn by a sister for a brother is an image of a native home, where all the storms that shake his life in a big city are missing. Romantic view of Emily on nature, her naive (or philosophical) confidence in her immutability and eternity give the poetry of the author a special power. In part, the images offered by the author resemble the sonnets of William Shakespeare, in which natural beauty is glorified.